(Newser) – Newt Gingrich managed to out-Trump Donald Trump in the wake of Thursday night's horrific attack in Nice, calling for nothing less than the ideological testing of all Muslims in the US and the expulsion of those who don't pass muster. "Let me be as blunt and direct as I can be. Western civilization is in a war. We should frankly test every person here who is of a Muslim background, and if they believe in Sharia, they should be deported," Gingrich told Fox News' Sean Hannity, per CNN. "Sharia is incompatible with Western civilization. Modern Muslims who have given up Sharia, glad to have them as citizens." 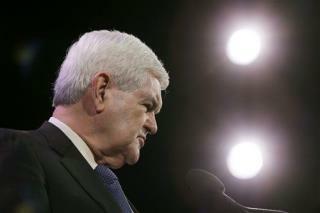 Gingrich added that Muslims should also have their mosques and online activities monitored. Newt is right, of course, but he will be roundly condemned for being so blunt and outspoken. If you understand the basis for, and content of, Sharia law, it is inescapably true that it is in direct opposition to the U.S. Constitution and the Bill of Rights. The facts are what they are, no matter how inconvenient. This might be a good moment for every American, no matter his or her affiliations, to ask themselves: Do I subscribe to and support the values expressed in the Constitution? Can we test and expell newt? If you believe in sharia law, you don't believe in the Constitution of the United States. If you swear an oath to undermine, or contradict the US Constitution, then expulsion is an appropriate measure. Western civilization is at war with sharia civilization. There is no doubt.